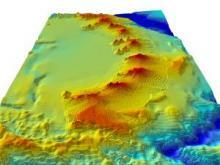 Navigating the ocean water depths of the remote South Sandwich Islands near Antarctica, scientists have discovered a chain of massive underwater volcanoes that stand thousands of feet above the ocean floor. Embarking on a month-long mapping expedition, scientists from the British Antarctic Survey (BAS) were expecting to find just a few volcanoes in and around the volcanically-rich area surrounding the South Georgia and South Sandwich Islands, but were amazed to find a chain of a dozen massive undersea volcanoes, some reaching as tall as 10,000 feet from the ocean floor. Dr. Phil Leat, a geologist and volcanologist and member of the BAS survey, said in report by National Geographic that it was “amazing finding them,” but noted that it was, at times, an overwhelming experience given that the volcanoes size rivals that of Japan's Mount Fuji. "You can see the surface rising up beneath you, and you don't know how high this thing is going to be," Leat said. "You inch forward. "But it's also very exciting, because you are discovering not just a volcano nobody knew about but a huge one." One of the main benefits of the newly discovered chain of volcanoes is that it may eventually help scientists to understand the impact of eruptions that take place when a volcano erupts underwater and subsequent after-effects of such eruptions such as tsunamis. “There is so much that we don’t understand about volcanic activity beneath the sea — it’s likely that volcanoes are erupting or collapsing all the time,” said Leat at the International Symposium on Antarctic Earth Sciences in Edinburgh. By better understanding how the eruptions and collapses of undersea volcanoes work, better methods of preparation for weathering natural disasters and early warning systems could be produced for areas rich in volcanic activity. The finding of the massive chain of volcanoes could be just the tip of the iceberg for scientist surveying the area as Leat noted that these types of sub-sea landscapes, where warmer waters dramatically alter the ocean habitat, could potentially lead to the discovery of new species of wildlife. "There's no coral, but they are habitats for life. When we've looked in these areas before, we've found new species." Studying the volcanoes' hydrothermal vents could even shed light on whether other moons and planets in our solar system and beyond, such as Jupiter's Europa, could harbor life forms capable of withstanding such a habitat.